Are dogs really better than cats? The crazy cat lady might not see beyond her kitty! For every cat person his/her feline is better than any dog on this planet. However research and actual facts paint a version drastically contrary to what cat owners would want to believe. 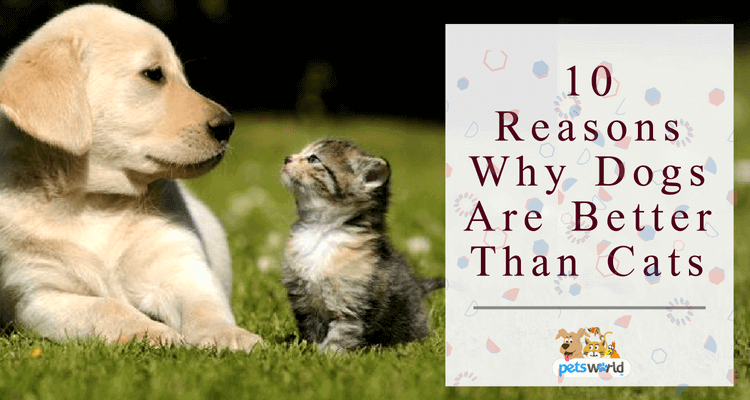 It has been confirmed that dogs make better pets vis-à-vis cats for not one but several reasons. As you near the end of this article, you’ll find yourself drifting towards man’s best friend. Whether you own a small or a big sized dog it will do its best to alert you and guard your home when confronted with intruders or strange noises. Even a small feisty pooch is enough to scare off nasty strangers with its shrill barks and growls. No one wants to be bitten by a canine! Cats on the other hand prefer to run far away from a menacing situation or simply hide instead of putting up a brave front. Canines enjoy running or going on long walks with their humans. Daily exercise is absolutely important for dogs. This means dog owners will have to indulge in some form of physical activity & interactive play to keep their pets motivated and engaged. A five year study performed on 2000 people in Australia brought to light the fact that dog walking can increase the level of physical activity in a large section of the community. Even older folks are seen participating in daily walks with their pooches. Cat people are rarely seen walking their felines on a harness since this isn’t a standard practice. Kitties like to be on their own whether indoors or outdoors and do what they like to do regardless of others. A study has shown that when people are out for a stroll or otherwise with their pooches, they end up chatting with strangers a lot more compared to when gallivanting alone. Pet dogs can act as a conversation starter between two individuals. Independent by nature, cats hardly accompany their people on walks or outdoor time. Dogs enjoy the edible prize and all the praise they get from their owners after a job well done! Training sessions also offer mental stimulation to your canine and this aspect is as important as physical activity. Your dog will enjoy learning commands like sit, stay, lie down, et al. The reward reinforcement approach works well with dogs and gets them to learn new commands and tricks. Training felines may seem like a bit of an ordeal. Even edible rewards may not excite the cat to pay attention and learn something worthwhile. A dog can never ignore its human and will always respond to its name when called out. Cats may tend to avoid their owners and act pretty elusive. A house trained pooch will go outdoors to relieve itself or to do its business. Their toilet time mostly coincides with their daily strolls. All you need is a poop scooper or a poop bag to clean after the pet. Cats use litter boxes placed inside the house to defecate and urinate. So cat owners have to deal with the smell emanating out of their kitties’ toilets. The daily scooping routine may seem like an unpleasant affair to some. Also the litter boxes need to be thoroughly cleaned and scrubbed once or twice a week. When shifting to a new home your pooch will be able to accept the changed environment more readily provided its human appears to be calm and happy. Cats don’t like to be faced with changes and take more time to adjust to a new environment, family member or pet. They may not feel instantly safe in a new setting. Dogs can be trained to assist the police force or perform military tasks. Detection or Sniffer dogs can detect explosives, illicit drugs, track criminals, find hidden currency and search for endangered animal species. Canines can also detect some cancers using their very strong sense of smell. They are able to identify odors linked with certain medical conditions. Then there are the mobility assistance dogs for the physically disabled. People with hearing or visual impairment can benefit from the support of service dogs. Canines can also work on farms to look after livestock. Rescue dogs help people escape dire situations. Cats however can only be used as therapy animals and not in other roles as mentioned above. Dogs can tell if a storm is approaching and will begin to bark loudly to caution its pack. They can also predict an earthquake. Pooches get to know if its human mama is pregnant. It is able to perceive the physiological changes and other transformations associated with pregnancy. Dogs can also be trained to detect an oncoming seizure in their humans and alert the latter. The alerting behavior includes pawing, circling or barking and may surface some minutes or almost an hour before the beginning of the seizure. Cats performing this way, well that’s completely unheard of! There are toy breed dogs to giant ones and everything in between! You can also find a dog that’ll gel with your temperament & lifestyle. Whether you want a laid back breed or a spirited pooch, there’s one to match every need. Cats do come in interesting colors and beautiful coats but don’t offer much variety when it comes to size or shape. For an animal lover dogs and cats mean one and the same thing, a bundle of fur to be cosseted with love and cuddles! Both felines and canines are unique in their own interesting ways. Rather than racking one’s brain over the choice of pet, why not create a compassionate and ideal setting where a cat and a dog can co-exist harmoniously.